Where do I use my Currys voucher code? Copy the code from NetVoucherCodes.co.uk. Browse the Currys PC World website and when you find the product you want then click 'Add to basket’. Click on your Basket to checkout and choose delivery options and other optional extras. Enter your email address to register or log in. On the following page enter your billing & delivery address and confirm your shipping method. On the ‘Order Summary’ page, click 'Add a voucher' and enter your Currys discount code into the box then click ‘Add’ your discount will be applied to your order total. Select your payment method and click ‘Continue’ to complete your transaction. "At Currys PC World eBay outlet you can bag yourself new & used laptops, TVs, smartphones & more. There are big discounts on TVs, laptops, smartphones, cameras and kitchen appliances. Lots of products are new, where items are used or refurbished it is clearly highlighted." Services at Currys PC World include Order and Collect, where you can reserve your items online and then collect and pay for them at your local store, and a Home Delivery and Installation service meaning you can start using your purchases straight away, without the hassle of installing them yourself - this service is also available for products not bought through Currys! With their Price Promise policy of beating prices of certain competitors, you can be sure you’re getting a great deal. If you’re unsure which is the right product for your needs then Currys have a useful Buying Guide section, which gives you information on product specifications, tips and hints and jargon busting advice, to help you identify which product is best for you. At Currys you can find appliances to help with household chores including free standing and built in kitchen appliances as well as fantastic entertainment products like TVs, home cinema and gaming and gadgets that make cooking a breeze. Currys sell appliances from a plethora of big brand names including Samsung, HP, Dell, Hotpoint, Bosch, Indesit, Whirlpool, Zanussi and much more. No matter what you need, whether it be a refrigerator, freezer, washing machine or cooker you can find it at Currys. At Currys PC World Computing is made easy. Here you'll find all the computing devices and accessories you want with a vast range of products from all the best names including Apple, Acer, HP, Google, Canon and more. 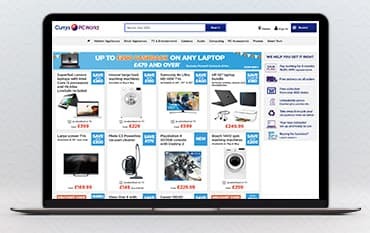 Browse the computing section at Currys and find laptops, Desktop PC's, tablets, iPads, eReaders, PC monitors, projectors, printers and scanners and all the software and accessories to go with them. Enjoy free collection in store, flexible payments on a buy now, pay later basis (if you so wish), unbeatable prices, optional set ups from Currys staff and expert service and guidance on all things computing if should happen to have a query or problem. An unwanted product can be returned for a full refund within 21 days of delivery as long as it’s still in its original, unopened packaging. How can I contact Currys? You can contact Currys by calling 0344 561 1234. Currys is the UK’s biggest electrical retailer, with stores throughout the country and an online site giving a huge amount of choice. With one of our Currys Voucher Codes you can make great savings on LED TVs, Laptops, Washing Machines, Fridge Freezers, Mixers and much more. Currys extensive range of products covers all electrical categories such as Home Appliances, Built-In Appliances, Small Appliances, TV & Entertainment, Audio & Phones and Computing. We are constantly on the hunt for first order Voucher Codes for Currys to help you with your money saving. Our experts check dozens of sites for secret codes including NHS discounts, student sites & social media channels saving you time & money!